Not everything that glitters is gold. Some are metallic. 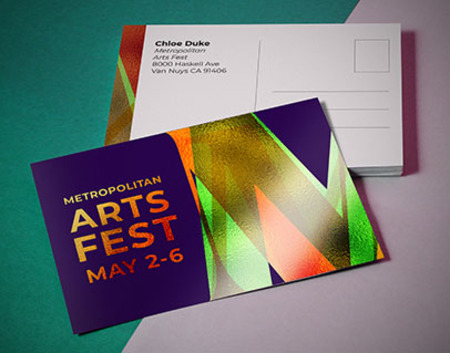 Metallic postcard printing adds prestige to your mail, are economical, flexible, and a highly effective marketing tool. Small businesses owners, designers, campaign managers, church organizations, and even hoteliers and restaurateurs can maximize the use of postcards for their business. Printed on sturdy 16 pt. cardstock gloss paper for longer-lasting use. Available in various sizes such as the popular 4”x 6” postcard size. You can choose print on one or both sides. Metallic printing elevates your business cards to a whole new level. Printed on thick 16 pt. cardstock, metallic business cards can take quite a beating. They’re the furthest thing from flimsy. The metallic finish can also be applied on one or both sides. Metallic business cards are available in different sizes with 3.5” x 2” being the most popular. Square business cards are also an option. Metallic foil printing isn’t rocket science. It’s a pretty straightforward process wherein a layer of silver ink is applied to paper before printing your artwork in regular CMYK colors. The result is a vibrant and shiny metallic finish. Metallic Neutrals. Gold, silver and bronze are the popular picks for this finish. Print metallic postcards in these shades for your save-the-date, invitations, premium menus, flyers, or for high-end marketing tools. Full-Color Metal Shine. Make your design even more special by adding colored metallic. Your postcards will be the center of attention, especially when it catches the light. Mail colored metallic postcards for festive events such as holidays, birthdays, and parties. Is Cost-Effective. Connect with more people while spending less. For such a small investment, you can reach thousands of prospects without paying an arm and a leg. Give a Personal Touch. A postcard allows you as a business to get close to your customers and communicate in a friendly social manner. Increase Visibility. Be seen and heard with shiny or colored metallics. Metallic postcards are more likely to be read compared with direct mail letters. Since they don’t have to be opened, all your information can be read at a glance. Offers Versatility. You can use metallic postcard printing for invitations, marketing messages, announcements, sales events, and even mini-newsletters. Think differently and get the most out of your postcards. Once you have a ready file, you can upload it to our site. If not, create a new one using our free downloadable templates. Get your free PDF proof after uploading to avoid any errors before we start the printing process. Good to know: Make sure you upload high-resolution files so that every detail of your design will come out clear and sharp. Scanned files are not accepted. Spot UV is a coating or varnish that is applied to a specific area on your postcard. This finish creates a high gloss effect and textured finish that draws attention to that part of your design. What is the best size to use for postcards? 4”x 6” is the standard size and the most popular pick for postcard mailing. These are handy and easy to store away, so they can be distributed and carried anywhere without any hassle. When can I expect my postcards to arrive? Your order’s arrival is based on printing turnaround plus shipping time. Printing turnaround is the number of days needed to produce your postcards excluding weekends and holidays. Shipping time is based on the transit time you selected and starts after the printing turnaround. Should I get the free file check? Our free file check allows you to see your design before it is sent for printing. This gives you the opportunity to make significant changes to your design and ensure it is free of errors. Ensure your artwork is formatted correctly for printing by using our postcard layout templates as guide. Choose from our many free layout templates in EPS, JPG or PDF formats for front and back side. Marketing with postcards continue to be one of the most popular and effective ways to build your business and reap the profits too. Since email and digital ads have become crowded avenues, it is getting harder for marketers to stand out from the competition.This is where postcards come handy. Keep things short and sweet for maximum impact. Make your message easy to read and understand. Always include a Call To Action.CTA’s can help get your reader to visit your store or website and try a new service. Metallic elements in your design put a spotlight on your CTA’s, which can help convert your postcard campaign into sales. Highlight a benefit statement. List down the advantages of getting your services or using your products. Give a reason to make them take action. Use vivid graphics and bold colors. Your postcards need to stand out to get readers, and metallic colors will let your postcards shine.